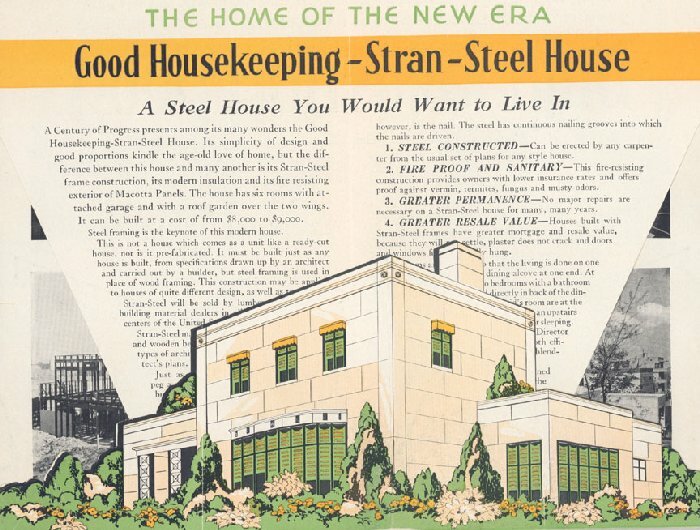 In conjunction with Good Housekeeping Magazine and the Detroit-based architecture partnership of H. August O'Dell and Wirt C. Rowland, the Stran-Steel Corporation created the Good Housekeeping Stran-Steel House for the 1933 Chicago Century of Progress Exhibition's Houses of Tomorrow display. 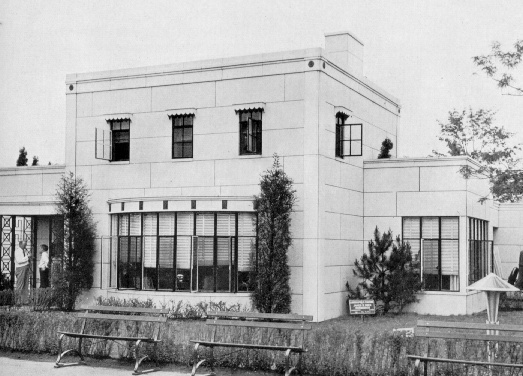 The house featured a steel frame sheathed with iron enamel modular panels, a previously unknown housing construction technique. For this project, Stran-Steel Corp. revealed a framework of interlocking joints with new lightweight steel beams that were lighter, more flexible and twice as strong as wood. Also highlighting the benefits of steel in residential design were specialty designed nails that penetrated the girders, holding the wallboard on both the inside and outside of the structure. The result was a sturdy and well insulated building that would withstand severe weather. 8 x 2 ft. sheets of 3 in. thick baked iron enamel were used to cover the outside of the structure, which not only provided a fire-proof surface but also gave an illusion of brick and helped as insulation. The 1 300 sq. ft. house sold for roughly $110 000 US today, and it was one of the few houses replicated for fabrication after the exhibition. Stran-Steel's growing reputation for livable and innovative steel design, specifically around modular structures, and prefabrication, would draw the attention of George A. Fuller and Co. and the US Navy when an increase in production and redesign of the Quonset Hut became necessary. "Good Housekeeping Stran Steel House." MoMA Org, accessed December 9, 2012. http://www.momahomedelivery.org/. "Good Housekeeping Stran-Steel House." Marshall.Edu.Org., accessed December 9 2012,http://users.marshall.edu/~brooks/stran-steel.htm. "Good Housekeeping Stran-Steel House." Marshall.Edu.Org. "Good Housekeeping Stran Steel House." MoMA Org. A updated house of similar origin and basic construction is located at 1600 Prestwick Road, Grosse Pointe Woods, MI and can be viewed on Google Maps.